It always pays to help someone in dire need whether or not compensation is at stake. Fortunately, for these two teens, the latter was true and they were each rewarded $266,677 (SAR 1 million) by King Abdullah of Saudi Arabia for their bravery. 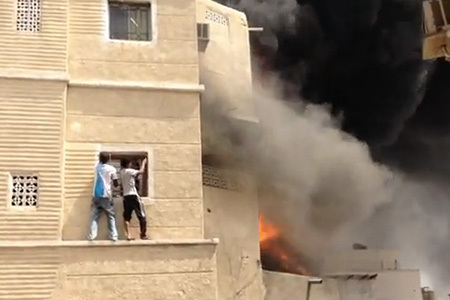 Continue reading to see the daring rescue.This video that shows the two Saudi Arabian teenagers in Jeddah climbing up to the second floor of a burning building once they discovered that an 11-year-old child was trapped inside. According to Rightthisminute.com, the fire was started by a gas explosion.